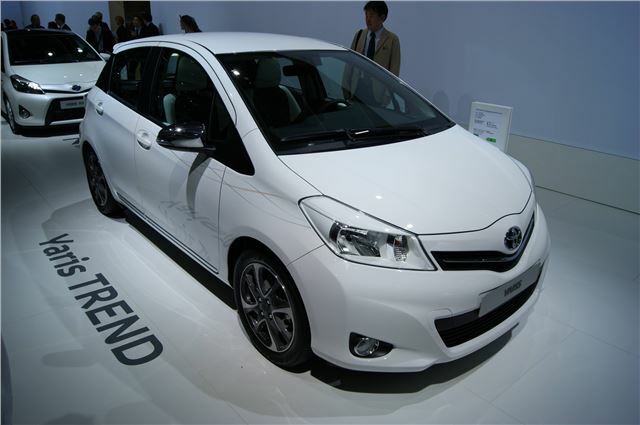 Toyota has premiered the updated 2013 version of the Yaris Trend, a model aimed at younger, style conscious buyers. The Trend trim level has only been on sale for a few months in the UK, so the Paris show car isn’t hugely different, but there are few tweaks here and there. Most obvious from the outside are the chrome taillight clusters, which replace the red units fitted previously. There are also some slight tweaks to the headlights and fog lights. Other details include chrome trim, a roof spoiler and black door pillars to give a ‘floating roof’ appearance. In the cabin there is a black and white theme with ochre stitching in the seats, which have been trimmed in a softer material. Other changes in the cabin include a shorter gear-lever with a larger knob and improved centre-console materials. When the updated Yaris Trend goes on sale next year it should be priced from the same £13,795 as it is currently.